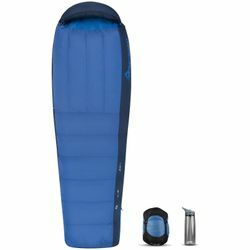 Sea to Summit Trek TkI 30 Sleeping Bag. The Trek™ down sleeping bag brings the comfort of a tapered-rectangular shape and the versatility of a dual-zip ventilation system to wherever your travels may take you. The full-length side zipper and secondary foot box zipper allow you to increase ventilation or open the Trek completely flat like a comforter, and the quality down will keep you warm and snug on chilly nights. The broader cut gives you room to move inside the bag, regardless of the sleeping position you may adopt. A Regular Wide model is available for those who really appreciate extra girth. Light and compact, the Trek might just become your favorite trekking / backpacking / travel / camping down sleeping bag. IS THIS DOWN SLEEPING BAG…? Warm enough for cool weather camping or travel? Yes. The quality down and 3D hood keeps you warm when the mercury drops. For colder-weather use, you would probably choose the Trek 10°F which has a draft collar – pair it with a high R-Value sleeping mat like the Comfort Light Insulated. Suitable for summer temperatures? Yes. A full-length side zipper and a secondary foot box zipper can be opened for ventilation or to turn the Trek into a fully-flat comforter in really warm weather. Able to be zipped to another sleeping bag? Yes. The main side zipper can be zipped to many Sea to Summit Women’s sleeping bags – Regular and Long bags have the same side zipper length. More room between hips and knees to allow you to sleep in a natural position without compressing the down insulation and creating cold spots. Full-length YKK® #5 main side zip and foot box zip provide superior ventilation and allow the bag to be used as a comforter. Shaped hood and oversized zipper draft tubes (Trek 10°F also has a draft collar, fits snugly around shoulders) to seal in warmth and keep cold out. ZIP OPTIONS: Full length left side and foot box zipper. Unzip fully to use as quilt or comforter. See ‘Features’ for bags which can be coupled to the Trek.